A non-profit making group – all funds raised go towards the costs of materials, refreshments and the occasional minibus for our days out. GOOD NEWS………We put in an application to take part in the Horwich Rotary Club’s Dragon’s Den event and were shortlisted! We were invited to make a 3 minute presentation at the event in June, and Mary Johnson and Mary Pryle went along to tell the judges (The Dragons) about our scheme to decorate Blackrod with yarn bombing at the Scarecrow Festival! Showing our samples of bench covers and bunting did the trick and we won!!! So we now have funding to pay for materials, and for a trip to the next craft show in September. Thank you very much to Horwich Rotary Club and all the Dragons! 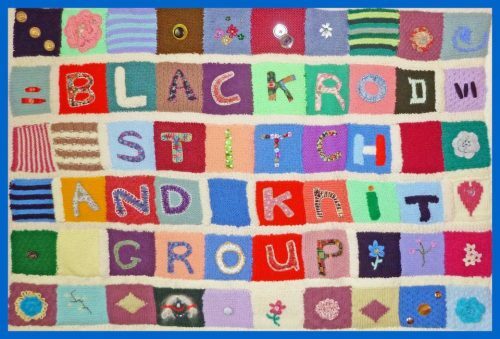 Look out for our yarn bombing at the festival – making Blackrod a brighter place. And BIG thanks to all the Stitch & Knit group for working so hard to make our woolly creations. You can buy lovely hand-made items at the Festival from our stall inside St Katharine’s Church. Come and see what we do.